Donate a can of dog food and help feed our hungry hedgehogs and other wildlife… Our hedgehogs get through an enormous amount of dog food every week. If you would like to help us with a donation of dog food, we’d greatly appreciate it. Visit our ‘Items needed’ page to see how you can help. For a wild animal or bird in need of help, call our casualty helpline: 0795 1285 366. Emergencies only between 8pm and 8am. We treat all casualties free of charge. N.B. Our resources are limited and are needed at the hospital. Please be prepared to bring your casualty to us. Please help the wildlife hospital by donating via our Just Giving page, thank you. 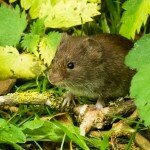 Easyfundraising is an easy way to raise money for Leicestershire Wildlife Hospital. Shop online with any of over 2000 well known retailers listed on easyfundraising.org.uk and a percentage of what you spend is passed to us at no additional cost to you. Simply click on the easyfundraising logo to register to support us today. PLEASE ALWAYS SPEAK TO A PROFESSIONAL WHEN YOU FIND A WILD ANIMAL! Even the most well-meaning person can do more harm than good if they do not know what they are doing- remember you are not always aware of what you don’t know. Just because an animal is eating, does not mean it is fully healthy! This poor girl was found out during the day in the snowy weather two weeks ago and the finders took her in and fed her. Unfortunately they failed to realise she needed treatment for wounds around her head, likely to be from being caught in something like netting. Perhaps someone else previously found her trapped and released her, without knowing she suffered constriction wounds which develop afterwards. Sadly, after feeding her for the last two weeks they only contacted us this morning with the idea of releasing her. We asked them to bring her down for assessment and we were shocked at her condition. She was absolutely emaciated, massively dehydrated, hypothermic, and in a state of collapse. Despite our best efforts, gently warming her in an incubator and giving fluids, she passed away within a few hours of arrival. The general rule is a hedgehog out during the day is a sign that something is wrong and it needs help (the only exception to this is during the summer when a round healthy mother who moving quickly with purpose to find food, water or nesting material should be left to continue on her way). Help needed will be more than just food and water. 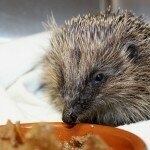 Hedgehogs will eat even when very unwell or suffering with severe wounds. They will also walk around until they get to the point of collapse, like this one. They can harbour internal parasites which can kill. If they are not correctly diagnosed and given the correct treatment required, hedgehogs will suddenly go severely downhill and have a much lower chance of recovery by this point. Please always seek advice from a Wildlife Rescue, or if one cannot be reached in an emergency then a local vet should be able to help. © 2019 Leicestershire Wildlife Hospital.